Alan Silvestri is now officially announced as the composer for Marvel’s The Avengers. Marvel.com posted the news today, welcoming Silvestri back to their cinematic universe. The key challenge for Silvestri this time around is to move from one big screen hero to a whole team, representing the entire cast musically. 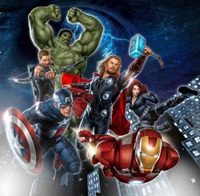 Continuing the epic big-screen adventures started in Iron Man, The Incredible Hulk, Iron Man 2, Thor and Captain America: The First Avenger, Marvel’s The Avengers has the world’s greatest Super Heroes assembling to pull the world back from the brink of disaster when an unexpected enemy threatens global security. Written and directed by Joss Whedon, the film stars Robert Downey Jr., Chris Evans, Mark Ruffalo, Chris Hemsworth, Scarlett Johansson, Jeremy Renner, Tom Hiddleston, Stellan Skarsgård and Samuel L. Jackson. It opens in theaters on May 4, 2012.